- For very little children, you can write famous lines from popular children's' poems or stories as little riddles by leaving a blank at the end, like - "Humpty Dumpy sat on a ______"(wall) or "Eight little sailors set out to sea, before they set sail the ship hit a ______(tree)." - If your kids love crossword puzzles, try writing clues that require filling in the blanks. The crossword will, in this case, be the last clue. It can comprise of a set of boxes, where the young ones have to fill in the answers from the previous riddles. The solution would lead the hunters to their treasure. This can work well for older kids. - Print your clues on white paper in white crayons. Then arm your young detectives with washable colored markers they can use to scribble on top of each clue to make the words visible. An idea sure to click with little children. - Device a code by assigning a number to each letter of the alphabet (eg, 1 for A, 2 for B...26 for Z). Then use the numbers to write your clues. This would go with kids in the age group 6-10. 9) Beneath a flower-bed. If you want to hide your treasure/clue under the ground, make sure to do so by placing it in a can, plastic bin, or other bury-able container. 1)Write all your clues on a piece of paper and keep it to yourself. That way, in case a clue gets lost or misplaced, you'll have no problem in leading the kids to the next one. - Tell the kids that there'll be no running across the street. The occasion being a treasure hunt, you can't, however, really expect them to conform to your injunction. So better keep an eye on them. - Ask the kiddies to read their clues properly. (You'll do well to assist the young ones by reading the clues they find out in a strong voice so that everyone can hear properly. Occasionally, they may get stuck at a riddle, and you may have to offer a verbal clue to keep the hunt going.). Tell them not to run off before a whole clue has been read, for they will surely be heading to the wrong place. Ask them to read it again and again (after you have read it once) and solve it bit by bit. - Declare beforehand that whoever finds the treasure has to share it equally among all the participants. 3)For little kids, trying to find pre-written clues may be a little difficult. It is easier for them when they already know the destinations. 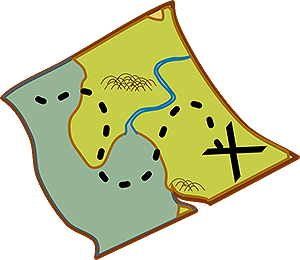 For this, you can create a map that has all the spots (where the clues are hidden, not the one hiding the treasure) illustrated on it. That way, the kids won't have a problem in locating the places. 4)See that the fun element remains intact. Tell the young ones that uncovering the hidden treasure is the goal, but the real, lasting reward is the hunt itself. The real success comes when each member has the chance to contribute his or her problem-solving talents or observations, and everybody gets to experience the satisfaction of working together as a team. If you succeed in implementing all these above-mentioned ideas to the hilt, your treasure hunt is guaranteed to be a hit!